No article has received as many comments as our last, “Human Error is NEVER the Root Cause.” In fact, one colorful commenter called it “the most ridiculous thing” he’s ever read. Given the feedback, I felt it warranted a revisit. First, by using the term root cause, I need to accept responsibility for incorrectly implying that there is only one cause to any event. Root Cause Analysis, as a term of art, is often used today to describe the search for preceding causes of accidents, events, or precursor conditions. Whether aircraft accident, financial system collapse, or a child receiving much better than expected grades, all events are open to having many causal components. 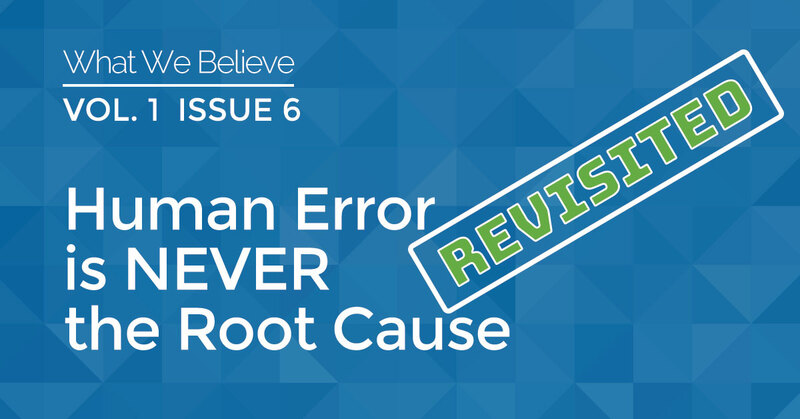 Root Cause Analysis need not imply a single cause. Nor need it imply investigation of only negative outcomes. Second, my use of the term human error, without an accompanying definition, led to a bit of backlash among commenters. Was I saying that humans could never be causal to an adverse outcome? Why did I not see that human error was the cause of all adverse events? The problem is a definitional one. Scientists and safety investigators tend to see human error through a laboratory lens – something like, “a human fails to achieve an intended outcome.” Learning and improvement are their goals, linguistic precision is not. Hence, it’s often the loosest of definitions. Lawyers, in contrast, demand the most precision because the answer may make the difference between life on the street and life in prison. A bank robber inadvertently shoots the security guard during a heist. Is it murder, or human error? Or both? In contrast to safety professionals, lawyers work in the world of negligence, recklessness, and malice aforethought. Human error, because of its general lack of precision, has no place in the law. Hence, criminal investigators and safety professionals are often left looking at the same evidence, just using a different lens to explain what they see. Then there is us – 6+ billion other people, who all are more than willing to toss around the terms slip, lapse, mistake, and human error. We don’t use the legal language because we don’t know what it means, and the scientific definition is simply too clinical for life on the street. Still, we are often quick to use the term, and when we cast it upon another human being, it is often an anchor of judgement and shame tied like an albatross around the neck of its victim. Ten years ago, Tony Romo, a star quarterback for the Dallas Cowboys football team, mishandled a football near the end of a playoff game. He botched the hold of the football for what would have been a game winning field goal. Ten years later that human error still haunts Cowboys fans (and Tony Romo). While socially we liberally use the term human error, it does have its nuanced attributes. We use the term human error to imply a sense of inadvertency, that the human did not intend the actions or its resulting outcome. To say, “I inadvertently ran the red light” is different than “I chose to run the red light.” In everyday language, human error is reserved for the unintentional act and the inadvertent outcome; no one uses human error to describe the conduct of a drunk driver or a suicide bomber. Additionally, if the probability of success is very low, we won’t call it human error. A narrowly-missed full-court basketball shot, although not intended to miss the potentially game winning basket, will generally not be called a human error. Calling a timeout when your team has none left, well, that’s a mistake. Socially, the use of human error involves a sense of expectation about what a human being should have been able to do under the circumstances. Failed attempts at actions with very low probability of success just don’t get the human error label. With that said, the intent of the earlier article was to suggest that this more social definition of human error is NEVER the root cause. In many, if not most, investigations of “unintended” outcomes, we find one or more human errors: those acts where a human inadvertently did other than what they should have been able to do. A radiologist misreads an x-ray. A pilot misinterprets a simple ATC instruction. A driver inadvertently drifts across the centerline of the road. All may be precursors to harm. All human error. All laden with inadvertency. It is in these cases that we suggest the investigation not stop. Merely pointing the finger at a driver who crosses the centerline does very little to prevent reoccurrence. That is why we suggest investigators get to the systems, and human choices, behind the human errors. A poorly marked curve in the road and texting while driving are both more actionable than trying to prevent what the human didn’t intend in the first place (crossing the centerline). Lastly, the earlier article did not intend to imply that we humans should not be held accountable for our actions. Whether a frontline employee or executive, we must all be accountable for our actions. What that accountability looks like is what led us to the development of the Just Culture concepts. As we’ve worked to implement a more just culture in high consequence industries over the past 25 years, we’ve adopted a more formal language around human behavior. We did this to roll back the ill-conceived criminalization of human error, and to bring much more precision to the everyday operational management of the organization. Remember, it’s not that we only investigate “accidents” within the business enterprise. We also need to investigate drug abuse, employment discrimination, sexual harassment, and theft among many other things. To understand and manage the full spectrum of human behavior, we use the words: human error, at-risk, reckless, knowledge, and purpose. Without such precise language, we’re stuck in the stone age of risk management. I do thank everyone who contributed to the dialogue. To extend it even further, I encourage you to come join me in a free 1-hour webinar on the meaning of human error. Whether lawyer, safety professional, or frontline manager, we guarantee an insightful and productive tour of a confusing concept in modern culture! This entry was posted in What We Believe. Bookmark the permalink. Thank you for your interest in the What We Believe series. Please complete the information below to receive notification of new issues in this release.